Last year, I was casually flipping through the channels and stumbled across The Real Housewives of Beverly Hills (Okay, who am I kidding? It's a total guilty pleasure and I'm a huge fan of the series). Don't judge! It's one of the only "reality" television shows I can stomach these days, and although the drama seems contrived, I mainly tune in each season for the fashion. I love Kyle Richard's style in particular. She looks flawless, and yet she seems more down-to-earth than some of the other ladies. I immediately fell in love with a cape blazer she wore in one of the episodes. While most people were probably glued to the t.v. watching Lisa Rinna throw a wine glass at Kim Richards, I was eyeing Kyle's beautiful cape and plotting how I could get my hands on a less expensive option. I think I literally sent my friend a text during the scene because I wanted one so badly. Fast forward to a couple of weeks ago, and stopping by Zara where I shrieked like a little girl when I saw one. I'm sure Kyle's cost a slight fortune, but mine was a bit more budget-friendly, although still more than I had anticipated. I used my birthday as an excuse to treat myself. you look so chic and yes Kyle does have great style. Fabulous outfit! Real Housewives of OC was my guilty pleasure TV show for years, so no judging going on here! I think the cape trend is very glam and fabulous and completely fits you! I haven't tried one on so I'm not sure how hard they are to wear, but I love the look! Well deserved birthday treat! OMG that cape looks so chic and stylish - it's definitely a forever piece - what a great purchase! Thank you Zeba! This is one trend I want to see you in because it would totally suit your style! Try it! 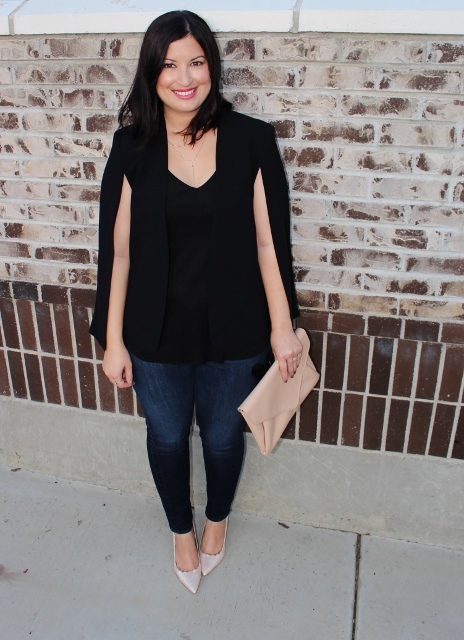 This blazer / cape is so cool! I don't think I've ever seen anything like it, it looks fab on you!